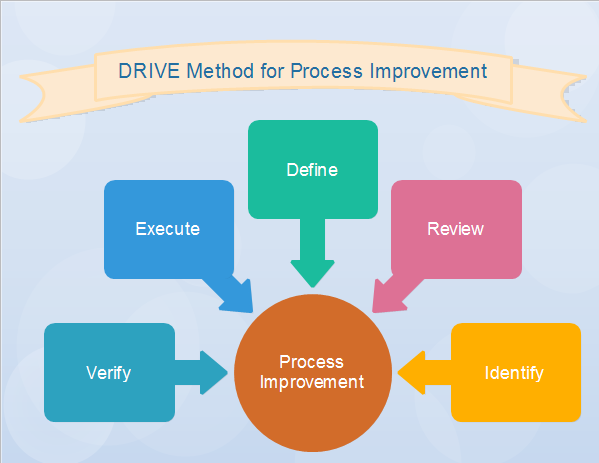 DRIVE stands for Define, Review, Identify, Verify and Execute. It is a simple and useful technique for problem solving and analysis that can be used to boost process improvement. Define the scope of the problem and the criteria by which success will be measured and agree on the deliverables and the success factors. Review the current situation, understand the background, identify and collect information, include performance metrics, identify problem areas, improvements, and "low-hanging fruits." Identify improvements or solutions for the problem as well as necessary changes to gain and sustain the improvements. Verify that the improvements will bring about benefits that meet the defined success criteria, prioritise and pilot the improvements. Execute the implementation of the solutions and improvements; plan a review; gather feedback and review.